Now there is a simple, comfortable way to deeply heat the tissue (FDA cleared) to reduce fat and inches! The TruSculpt system, a breakthrough non-invasive radio frequency and massage technology, is now available to you. In just one or two treatment sessions for one hour or less, you can be on your way to a new self with no downtime. TruSculpt is a breakthrough, non-invasive radio frequency (RF) and massage technology that allows comfortable treatments at therapeutic levels. The truSculpt handpiece is placed on a patient’s skin in the area to be treated. An RF pulse is applied for up to four minutes. Once the pulse is complete, the handpiece is moved to the next area. The total procedure lasts less than an hour. TruSculpt is designed to provide a safe and comfortable procedure. Side effects can include redness, swelling and mild tenderness in the treated areas that usually resolve within a few hours. 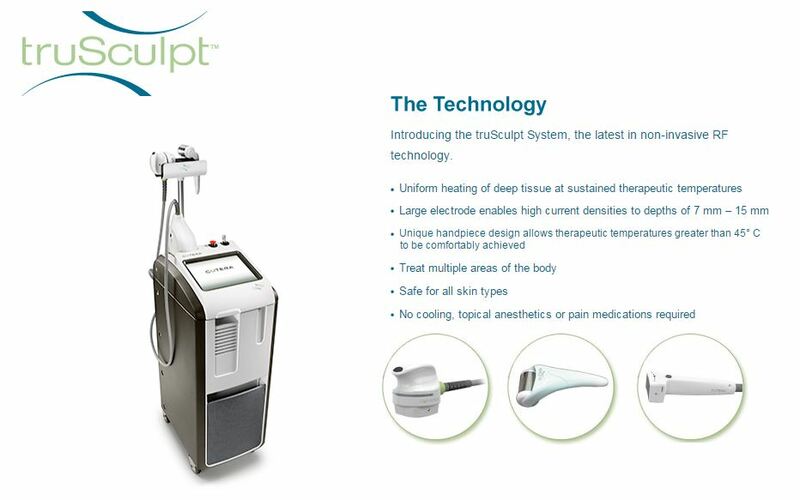 The truSculpt system is designed to be a comfortable procedure. As the truSculpt handpiece delivers energy, patients will feel a hot sensation at the treatment site. The practitioner can adjust the temperature depending upon your comfort level. Typically no pain medication, topical anesthetics, gels or active cooling will be needed. The practitioner will decide the number of treatments based upon the area(s) you wish to have treated and desired results. Typically, a patient will receive 1 or 2 treatments with each treatment about 2 months apart. Yes, truSculpt is safe for all skin types. Can patients return to normal activities after treatment? Yes, the procedure is non-invasive and typically patients can return to normal activities immediately. Often, patients return to work after the session. When will patients start seeing results? After a truSculpt treatment, visible results can be seen as soon as 4 weeks with maximum results taking up to 12 weeks. Results may vary patient-to-patient depending on the areas treated and the number of treatments administered. The cost varies based on a patient’s areas of concern, number of treatments needed, the patient’s ultimate goals and geographic location. for your FREE consultation and Prices. How can I find more information about truSculpt treatment?